Written by owl and bear staff on Tuesday, September 8th, 2009 at 1:39pm. We at Owl and Bear are strongly against the Beatles version of Rock Band, releasing 9/9/09. Look, we have nothing against people trying to make some money. Plus, we think it’s great that kids are getting into music and learning that getting good with a guitar-shaped joystick will automatically translate into the ability to shred with an ax. Dylan and Hendrix used to go head to head on the Atari version of Rock Band, to be sure. But this Beatles version is ridiculous. As children, we used to watch the TV show The Monkees and were convinced for many years that they were an actual band. In middle school, this led to the unfortunate incident during a class presentation—while trying to hide our unstoppable erections—where we confessed that the Monkees (sic) were our favorite band. Everyone laughed, especially the teacher, who led the charge. We wet our pants—no easy task while sporting an erection—and ran straight home. During our urine- and tear-soaked sprint, our minds raced over all the times that we had gushed about the Monkees, believing they were real, and how the other person must have been judging us! So distraught were we, yet we had nothing to comfort us. Normally when life would give us one to the pooper, we’d pop on a Monkees record, but that wouldn’t fly anymore. Once a source of consolation, those Monkees records became nothing more than trophies of our shame. Simply put, we’re not going through that again. And we could see it happening. Easily. 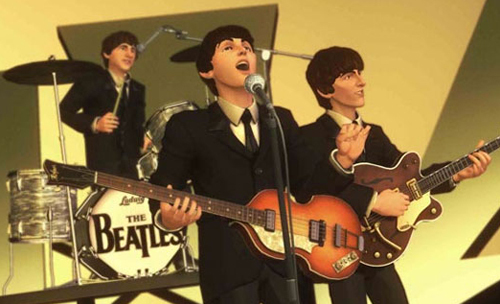 We’d play The Beatles: Rock Band and we’d think, “This is some pretty cool stuff. In fact, it kind of rocks.” We’d talk about it around the office, the new forum of awkward boners, and people would think we’re weird for taking a band based on a video game—these Beatles (sic)—too seriously. We’re not falling for it. Not this time. No thanks. Call me when the Monkees version comes out.